Since 1899, with the introduction of their now famous dip pen, Speedball has helped artists around the world find the perfect colour, the perfect nib and the very best ink. 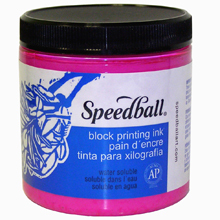 We carry a full range of Speedball drawing nibs and inks in addition to block and screen inks and tools. Give your creations all the brilliance they deserve with inks from Speedball. 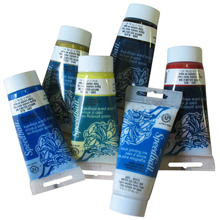 Speedball’s Water Soluble Block Printing Inks come in 18 brilliant colors available in 37cc, 75cc, 150cc tubes. These inks are easy to clean up with water, non-toxic, gluten free and super for printmaking with linoleum, wood, Flexible Printing Plate, Speedy-Carve™, Speedy-Cut™ and Polyprint. 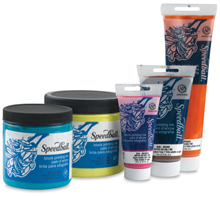 All Speedball inks are AP Non-Toxic and are excellent for use in the studio, school or home. Speedball's Oil-Based Block Printing Inks available in 10 brilliant colors in 37cc tubes. Suitable for printing on papers and fabrics, they are non-darkening, waterproof and permanent. Handy beginner Block Printing Sets now available at Art Placement. Each set contains 6 colours in 37cc tubes. Water Soluble and Oil-Based sets available. Lino cutting blades fit interchangeably into the Speedball Lino Cutter Handle. The regular style blades come in 6 shapes/sizes, for traditional carving where carving force is applied away from the user's body. The Zip Cutter style blades provide a safer alternative. Their "bent" design, means that the carving force is applied in the opposite direction, towards the user. This allows for greater control and reduces the likelihood of accidental slips and injuries. Please note: all of these tools are sharp and can easily cut skin. Great care should be exercised when using any sharp tool. Excellent for scrapbooking and other craft applications, these brayers feature removable rollers for easy cleaning with a comfortable handle. Acrylic Brayer. 4" Roller is made of clear acrylic for gluing applications(rubber cement or wax will not stick to roller) $21.05 each. High density rubber blocks provide a fast and easy carving surface for students, printmakers and stamp carvers. The Speedy Cut block is slightly thicker, which allows a shallow design to be carved into both sides.The Speedy Carve block is very flexible and durable and will not crack, crumble or break. Speedy Carve easily transfers a range of images from ink jet printers,clip art and newspapers. The Speedy Cut Easy blocks are very smooth and easy to carve. Flexible, will not crumble or break. Use slightly warm iron to transfer ink-jet and laser-print images. Red Baron® Linoleum Blocks - Speedball is now offering traditional "battleship" gray linoleum available in a wide range of sizes. 1/8" thick blocks have a jute backing. Ideal for use with either oil or water-soluble block printing inks. Block Ink Retarder-slows ink drying time, while maintaining viscosity. Block Ink Extender-maintains viscosity and increases ink transparency to increase application options.